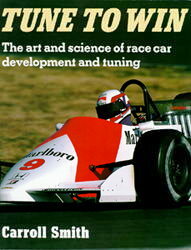 "The racing car is an inanimate object; therefore it must, eventually, respond to reason." "The racing car exists only to allow one man to negotiate a certain fixed distance in less time than any other combination of man and machine present that day. Whether the distance happens to be 440 yards of a drag strip, 200 laps of Indianapolis, 14 laps of the Nurburgring or 1000 miles of Baja landscape is immaterial."